I setup my Ice Cream Stand in different neighborhoods and situations. With it I map the variety of tastes and smells from the big city: “New York,” the destination of so many different tribes. I concentrate the tastes and smells and memories into a comestible frozen liquid serving with which you can participate in a simple ephemeral tasting experience. “NY Flavors Ice Cream” is my own Cultural Anthropology study. New York contains an incredible variety of small tribes which co-exist in these five boroughs. Even if in each era the borders change quickly, the cultural and edible particularities stay, remnants for the 2nd and 3rd generation Americans. I am constantly on the sniff for new mixtures, boundaries, and essential tags. 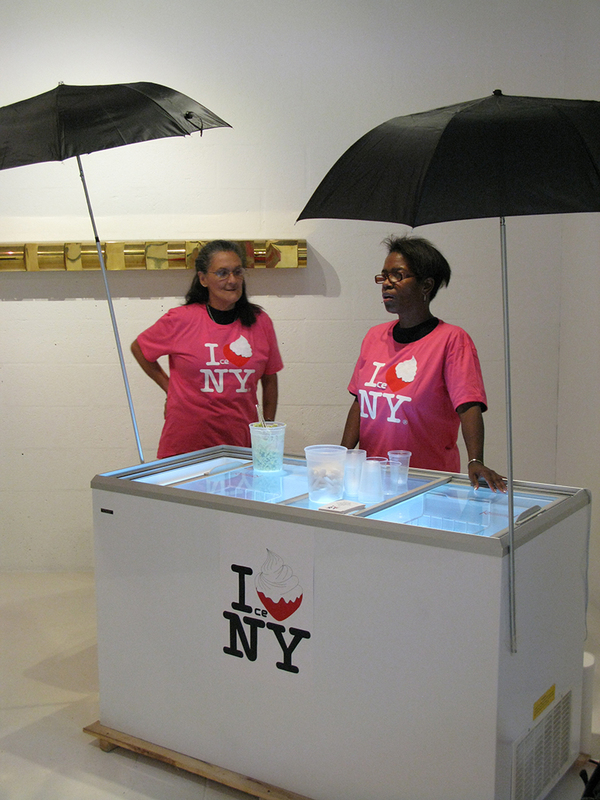 With my NY Flavors Ice Cream I try to highlight the cultural diversity of New York City. I made a simple cart from which to serve ice cream. It reminds me of the mom and pop food carts used by first generation immigrants to bootstrap their existence in a foreign country, first by selling to other immigrants from their homeland, then slowly melting into the dominant culture. ISSN 2426-3893 - © 2014-2019 ALOHA EDITION - C.N.R.S. - All rights reserved.